Sergei Vasiljevich Lebedev (Russian: Серге́й Васи́льевич Ле́бедев; July 25, 1874 – May 1, 1934) was a Russian/Soviet chemist and the inventor of the polybutadiene synthetic rubber, the first commercially viable and mass-produced type of synthetic rubber. Lebedev was born in 1874 in Lublin and went to school in Warsaw. In 1900, he graduated from St. Petersburg University and found work at the Petersburg Margarine Factory. Starting in 1902, Lebedev moved from university to university in Russia, starting at the Saint-Petersburg Institute for Railroad Engineering. In 1904, he returned to St. Petersburg University to work under Alexei Yevgrafovich Favorskii, (Russian: Алексей Евграфович Фаворский; (Pavlovo, in the Nizhny Novgorod Oblast, 20 February [O.S. 3 March] 1860; Leningrad 8 August 1945), Stalin Prize, 1941, for contributions to the manufacture of synthetic rubber. In 1915, Lebedev was appointed Professor at the Women's Pedagogical Institute in St. Petersburg. After 1916, he was a Professor of Saint Petersburg Academy for Military Medicine. In 1925, he became the leader of the Oil Laboratory (after 1928, the Laboratory of Synthetic Resins) at St. Petersburg University. He died in Leningrad and is interred in Tikhvin Cemetery. Lebedev's main works are devoted to polymerisation of diene hydrocarbons. He was first to research the polymerisation of butadiene (1910-1913). In 1910, Lebedev was the first to get synthetic rubber based on poly-butadiene. His book Research in polymerisation of by-ethylene hydrocarbons (1913) became the bible for studies of synthetic rubber. After 1914, he studied polymerisation of ethylene monomers, leading to modern industrial methods for manufacturing of butil synthetic rubber and poly-isobutylene. Between 1926 and 1928, Lebedev developed a single-stage method for manufacturing butadiene out of ethanol. In 1928, he developed an industrial method for producing synthetic rubber based on polymerisation of butadiene using metallic sodium as a catalyst. This method became the base for the Soviet industry of synthetic rubber. The Soviets lacked reliable access to natural rubber, making the manufacture of synthetic rubber important. First three sinthetic rubber plants were launched in 1932-33. For butadiene production they used grain or potato ethanol as a feedstock. It caused a number of jokes about "Russian method of making tyres of potato". By 1940, the Soviet Union had the largest synthetic rubber industry in the world, producing more than 50,000 tons per year. During World War II, Lebedev's process of obtaining butadiene from ethyl alcohol was also used by the German rubber industry. Another important contribution of Lebedev's was the study of the kinetics of hydrogenation of ethylene hydrocarbons and the development of a number of synthetic motor oils for aircraft engines. In 1932, Lebedev became a full member of Academy of Science of the USSR. In 1945 the National Institute for Synthetic Rubber was named "Lebedev's Institute". 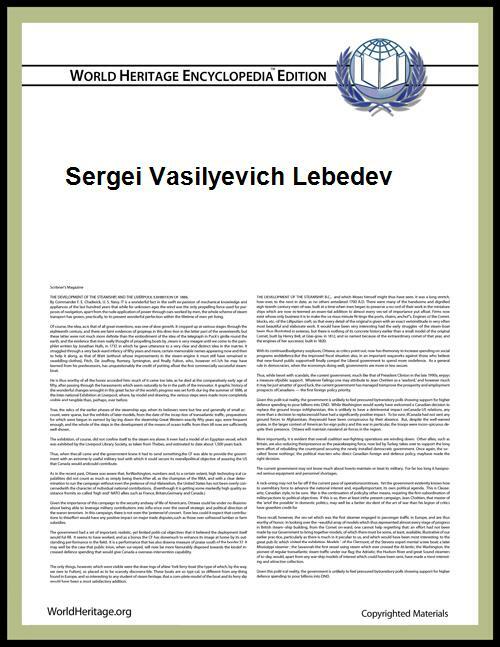 Commons has media related to Sergei Vasiljevich Lebedev. Place of birth Lublin, Congress Poland, by then integrated in the Russian Empire, (1795 to 1918).